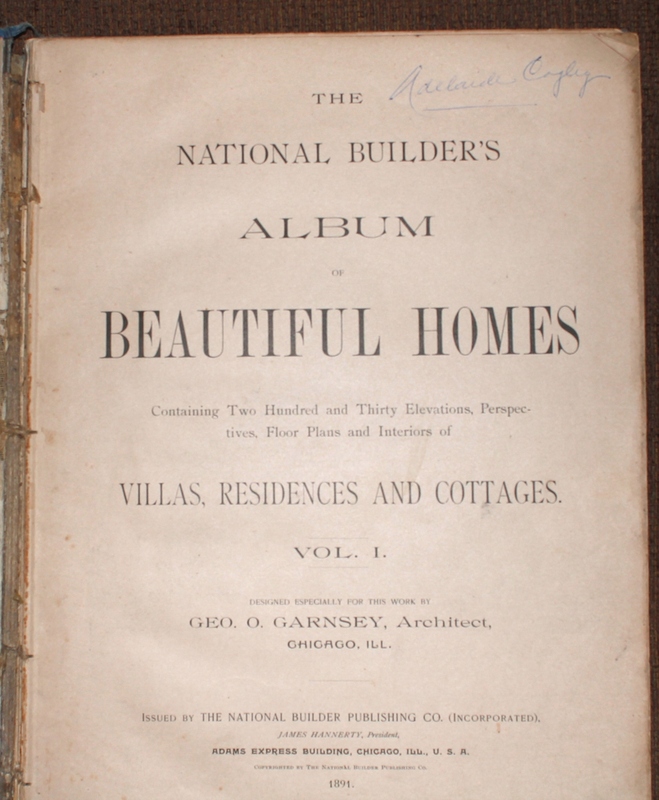 So I took the first step in the restoration of The Album of Beautiful Homes. I was a little bit nervous but once I jumped in everything seemed to go alright. I laid out my tools (Fig, 1) and got to work. The first step was to remove the text block from the case. I did this by running a razor inside the cover to peel back the mull (Fig. 2 & 3). This was done to both the front and back cover. Basically just a slice on the inside cover and then using the micro spatula to lift. Mull is just sort of a stiff cheese-cloth-like material that is attached to books and then used to attach boards by pasting end sheets over them. Once the text block was free I worked to remove the mull from the pages. This was the most delicate job because there seemed to be extra glue from some older repairs so there were extra strong bonds in places. Going too fast might tear pages and either make for a LOT of extra work or destroy the book completely. Again, the micro spatula was enlisted to gently pull the mull away (Fig. 4 & 5). There were two places along the spine with big globs of some amber colored glue. It was really brittle so it may have been horse glue. Those areas took about 10 minutes each to get the mull off. I worked another several minutes on each area to get most of the glue off. There will be more to do but I need to decide how the final glue removal is to be completed. After the mull was away and most of the glue residue was removed I took a few minutes to clean my table and then started the process of separating the signatures (sections). I used the spatula, razor, scissors and tweezers. I gently pulled each signature, one at a time, by moving the spatula from inside the text block outwards to the spine. I would locate the separation between the sections and lift. This required a lot of patience because there was extra glue in some areas. Once the glue/chemical bond was broken I cut the cords going to the next section down and lifted. When the section was free I opened it flat on the table and removed cord pieces and sewing thread. This process was repeated for each signature (Fig. 6, 7 & 8). After separating all the sections I went on to removing the tape that was holding one of the pages (leaves) in place. The ‘repair’ was done with masking tape. Again, using the micro spatula, I gently worked the edges of the tape, putting more pressure on the tape than the paper of the book. I worked the spatula in a small area until that started to lift then I went a little further and eventually the tape came away (Fig. 9). There was a total of 3 pieces of tape, each piece took about 10 minutes to remove. Now that everything was separated I was able to take a close look at the damage to the book itself. There are tears in some sheets at the head and tail, some of the pages are completely torn free and the edges of one page are damaged so badly that it will have to be re-formed with new paper laid over the damage to get it back to the correct dimensions. (Fig. 10 & 11). The last step for this part of the project was to number the sections and then lay them flat to relax the sheets for further work. Using a pencil I numbered each section inside the gutter (fold) so they could be reassembled later (Fig. 12). After this I laid each sheet out flat, sprinkled on some baking soda to absorb some of the musty smell and stacked the sheets up. After the sheets were stacked I put my cutting mat on top with a couple of books to hold the sheets in place and slowly press the folds out (Fig. 13). I will leave the pages like this for 3 or 4 days before continuing on. One of my original thoughts was to de-acidify the paper. Books printed in the late 1800’s used wood pulp and the acid content can cause pages to become brittle and fall apart. After researching the process I decided that this was too risky for this project. There is a potential of printing being damaged, pages might curl up and if the paper isn’t pressed and sized properly there could be irreparable damage to the pages. My goal with this project is to make the book serviceable and able to be enjoyed. At some later date if somebody wants to have the pages treated they can do it at their own peril. Next time I will be guarding the pages and repairing damaged sheets prior to sewing up. Thanks for reading, as always feel free to comment or ask questions. Figure 1: Tools L to R, Steel Rule, Combination Square, Snap Razor, Scissors, Awl, Tweezers, Micro Spatula, Brushes, Bone Folders, Steel Straight Edge. At the top are Dividers and Leather Paring Knife. Cutting the endpaper and peeling up the mull to remove text block. The text block comes free from the case. Working the mull away from the text block. Completing removal of the mull. This is a particularly tough area, possibly repaired with horse glue. Separating sections using the micro spatula. Freed section opened to remove thread an cord. Damaged sheet with rips along spine edge. Small number inside gutter will keep sections organized. Sheets laid flat and sprinkled with baking soda. Under weight for four days. This entry was posted in Antiquarian Books and Ephemera, Book Binding, Crafts and tagged Antiquarian, Book Arts, Book Conservation, Book Restoration, crafts, Rare Books, Restoration, Vintagier. Bookmark the permalink.